Boehm Titration proposed by Boehm in 1966 is one of many methods to characterize surface chemistry of adsorbent. Acid/base titration theory is widely used because it can effectively determine oxygen-containing functional groups of adsorbent surface and obtain information of groups. Boehm titration is based on the theory that acid and base in aqueous solution react with various basic sites and acidic sites of AC which are derived from different oxygenated groups, respectively. Hydrogen ion of carboxylic groups and phenolic groups is replaced by sodium cation of sodium hydroxide, forming sodium carboxylates and sodium phenolates, when sodium hydroxide reacts with carboxylic groups, and phenolic groups of AC surface. In reaction of sodium hydroxide with lactonic groups, sodium carboxylates and phenolic groups are formed. 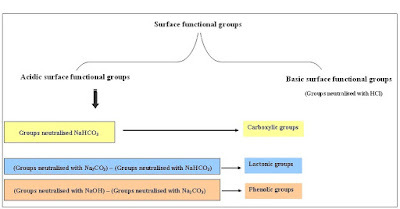 Owing to basic property of sodium carbonate poorer than that of sodium hydroxide, sodium carbonate centralizes only carboxyl groups and lactonic groups. Sodium bicarbonate reacts only with carboxyl groups of AC surface, yielding sodium carboxylates due to its poorest basic property among the three bases mentioned above. 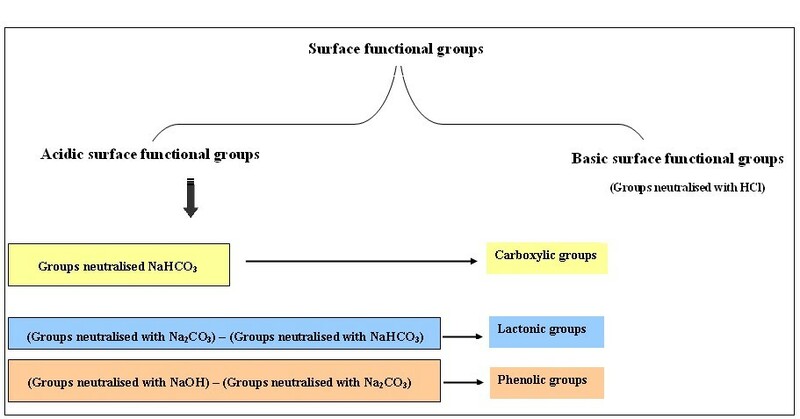 It comes to conclusion that the incomprehensive information, instead of total surface information, of oxygen-containing groups of AC can be discovered by results analyses of Boehm titration due to ability of the titration to qualitatively and quantitatively detecting only some surface acidic groups (carboxylic, lactonic, and phenolic groups) and the basic groups. However these analyses could not be performed for the sewage sludge based adsorbents (SBACs) because they contain high contents of ash and then inorganic compounds which can react with the acids and bases.